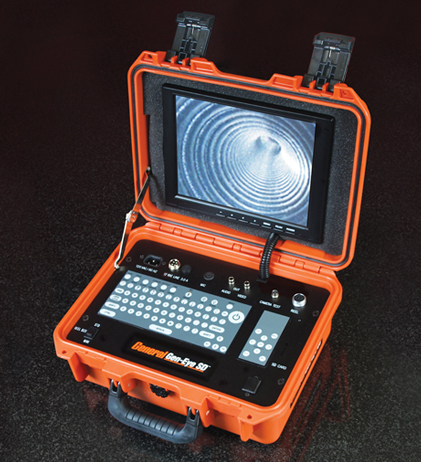 The upgraded Gen-Eye SD® Series pipe inspection cameragives you all the features of a full size video inspection system in a compact, portable package. The integral SD Card Reader records video or still images – it can store as much as 32 GB of data on one card. Keep a copy for your records and make copies for your customers. In addition to the card reader, the Gen-Eye SD Command Module includes a large 10.4” LCD color monitor for crisp, clear pictures. And the full-size, waterproof keyboard permits nine pages of on-screen titling. It also sports an on-screen distance counter, built-in voice-over microphone with switch, LED dimmer control, camera test port, and video and audio out connections for external recording devices. All are safely contained in a heavy-duty, padded Pelican case weighing just 12 lbs. The fully adjustable docking arm lets you mount the monitor on a big capacity reel loaded with Gel-Rod® push-rod and a color self-leveling camera. 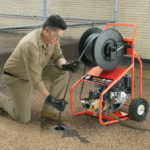 With this easily maneuverable, all-in-one package you’re all set to trouble-shoot 3” to 10” lines with the standard reel, or inspect 2” to 4” lines with the mini-reel. 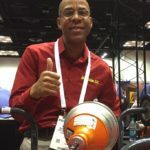 The standard reel holds 200 ft., 300 ft., or 400 ft. of push rod on a sturdy frame and takes up little space in your truck. Ten inch wheels ensure easy transport to and from the job. The mini reel carries 100 ft. or 200 ft. of push rod in a compact frame for easy handling without taking up too much room in your truck. The larger 10.4” LCD monitor gives you crisp, clear images to make it easier to see the picture while doing inspections. Larger 10.4” LCD transflective screen makes is easier to see the monitor while doing inspections outdoors in bright sunlight. Record video or still images. Stores as much as 32 GB of data on one card. Sends video to your Smartphone or tablet. 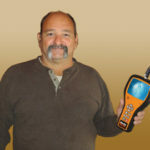 A free App lets you easily view and record video inspections at a range of up to 300 feet. For remote applications far from a power source. Battery last for up to 4 hours. Panel indicator lets you know when the battery is running low. Automatically keeps picture right side up as the camera glides through the line. Just 1.625” in diameter with 16 Bright-White LED’s to illuminate up to 10” lines. Internal 512 Hz transmitter, dimmer control, camera test port, 2″, 3” and 6” trap skids, and storage compartment for power cords, tools, and remote controls. Includes SDN-500 Command Module, SL-GL-200 reel with Self-Leveling Color Camera, Docking Arm and 2, 3, & 6″ skids. Same as SL-SDN-A, plus GL-100 Hot-Spot Locator. Includes SDN-500 Command Module, SL-M-GL-100 mini reel with Mini Self-Leveling Color Camera, Docking Arm and 2 & 3″ skids. Includes SDN-500 Command Module, SL-M-GL-200 mini reel with Mini Self-Leveling Color Camera, Docking Arm and 2 & 3″ skids. 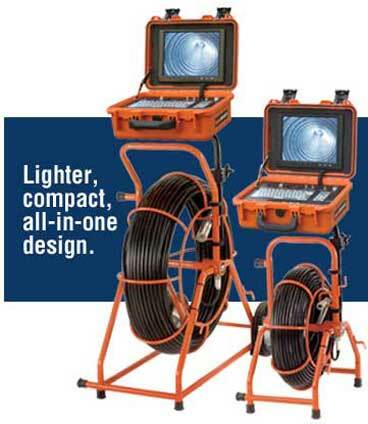 Includes SDW-500 Command Module with Wi-Fi, SL-GL-200 reel with Self-Leveling Color Camera, Docking Arm and 2, 3, & 6″ skids. Includes SDW-500 Command Module with Wi-Fi, SL-M-GL-100 mini reel with Mini Self-Leveling Color Camera, Docking Arm and 2 & 3″ skids. Includes SDW-500 Command Module, SL-M-GL-200 mini reel with Mini Self-Leveling Color Camera, Docking Arm and 2 & 3″ skids. Includes SDP-500 Command Module with Wi-Fi, Sunlight Readable Screen, 4 hr battery, SL-GL-200 reel with Self-Leveling Color Camera, Docking Arm and 2, 3, & 6″ skids. Includes SDP-500 Command Module with Wi-Fi, Sunlight Readable Screen, 4 hr battery, SL-M-GL-100 mini reel with Mini Self-Leveling Color Camera, Docking Arm and 2 & 3″ skids. Includes SDP-500 Command Module, SL-M-GL-200 mini reel with Mini Self-Leveling Color Camera, Docking Arm and 2 & 3″ skids.